From time to time, newspapers have been publishing accounts of local haunted houses for well over a century. 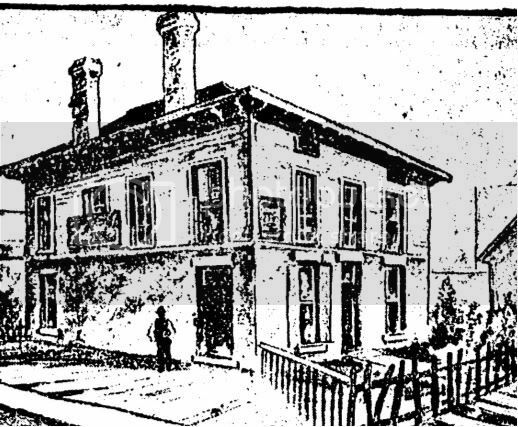 Many of the best Chicago ghost stories relate to buildings that are now lost and gone forever – for instance, the Robey Tavern on Robey (which is now Damen) and Washington was said to be haunted by Mrs. Robey, who walked the grounds in a black dress with a white lace collar, ringing her hands and sighing. The story went that the city’s first “hanging bee” was held at a tree on the property, which is now little more than parking for the United Center. In the 1880s, a rickety frame house stood on the Northwest corner of Halsted and Lill, near Lincoln Avenue (very close to both the Biograph Theatre (which, believe us, is NOT haunted) and The Tonic Room). The story went that sometime in the 1870s a man and his two children were found murdered in the house. The bodies were found on the first floor, but, based on blood stains found on the stairs, had apparently been dragged down from the garrett. Chris Helm, who owned the ramshackle frame house in the 1880s, offered $5 to anyone who would spend the night in the garrett, where the ghost seemed most active. He claimed that anyone who tried would be awakened by horrible screams and open their eyes to find a woman in white with eyes like saucers holding out a plate of burning sulfur. Two people attempted to sleep there, and neither lasted more than an hour. Policemen on the beat claimed that they wouldn’t go near the place. Helm was still telling the same story 10 years later! It’s worth noting, of course, that Helm tended to get people REALLY drunk before sending them up to the garrett, suggesting that the guy was faking the ghost to scare people away – a regular Scooby Doo villain! On the site now: a large brick building now occupies the spot where the old house stood.